At the time, there was about 150 Jews in Maryland. Thomas Kennedy had never even met one, but he was outraged by the injustice of excluding an entire group of people because of their religious beliefs. For him, religion was “a question which rests, or ought to rest, between man and his Creator alone.” The bill reported out of the committee in January 1819 was entitled “An Act to extend to the sect of people professing the Jewish religion the same rights and privileges that are enjoyed by Christians.” When it was defeated, Kennedy pledged himself to renew the fight. The following year, Kennedy reintroduced the bill and it was defeated again by a wide margin. These efforts to secure religious liberty for the Jews brought him virulent attacks as “an enemy of Christianity” and a “Judas Iscariot” and, in the election of 1823, Kennedy was defeated by Benjamin Galloway, who had spoken out strongly against the “Jew Bill”. Even while out of office, Kennedy declared his intention to continue the fight: “although exiled at home, I shall continue to battle for the measure, aye, until my last drop of blood.” In 1825, Kennedy ran for the House of Delegates as an independent and was elected. By this time, public and press opinion in the state had turned in favor of the measure, and in 1826, the bill became law. (Source: Teaching American History in Maryland). 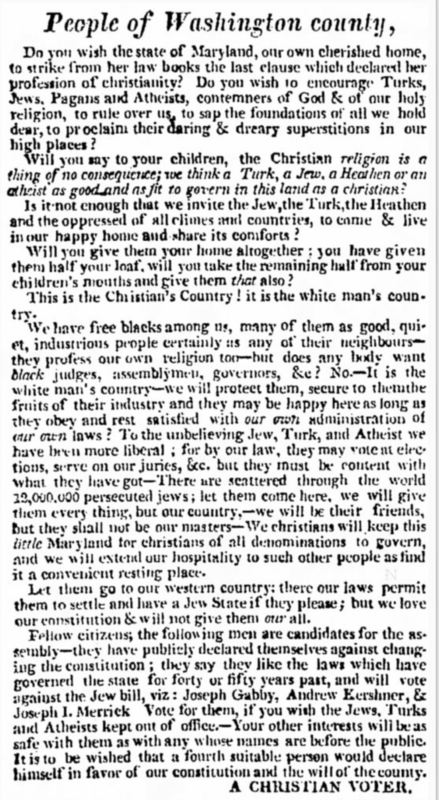 Interesting to think over, considering some of the rhetoric circulating in the times in which we live… some 193 years later after this article. Out of curiosity, I looked-up the three men and found that Joseph Gabby, Andrew Kershner, and Joseph I. Merrick were all elected. Though the other two were not reelected in the following year, Merrick was… and was again in 1825, when Kershner was also seated, once again. Thereafter, all three faded from the listings for these positions. Kershner “represented the county in the Maryland Legislature seven times, and was a man of widespread influence and popularity.” He died in October 1857, and was buried at the German Reformed Cemetery, in Hagerstown. Merrick was a “prominent lawyer, who resided in Washington, D.C. , for some years before his death. He died in June, 1854. Gabby… I found a lot on him, but, in short… he served on the Governor’s Council and in the House of Delegates, and as County Levy of the Court. He died in November, 1856, and was buried at the Presbyterian Church Cemetery, in Hagerstown.